Any development that has the name Trump in it, summons to mind, luxury and opulence. Donald Trump and Micheal Dezer partnered to build this incredible three building enclave called Trump Towers in Sunny Isles Beach. Largely seasonal elite occupants enjoy the blinding white sand beaches and proximity to Miami Beach and Bal Harbour. Trump Tower is one of four projects by Donald Trump in Sunny Isles Beach, and it is a premier location with incredible amenities. 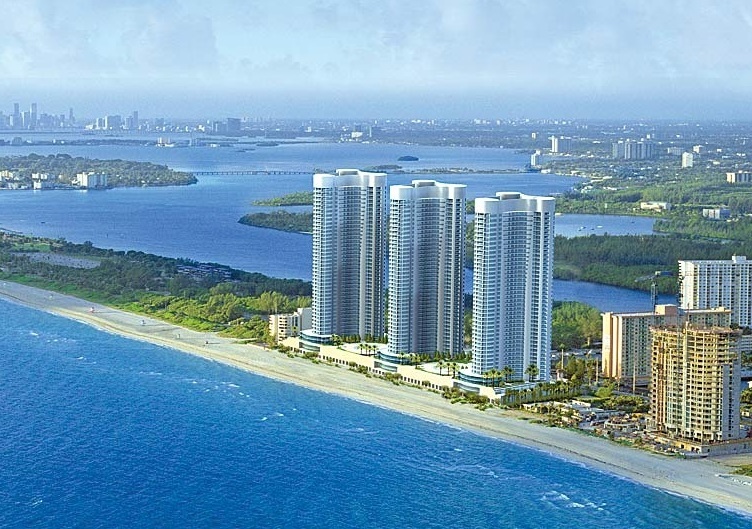 Each tower is 45 stories high, and have breathtaking views of Hallandale and the Atlantic Ocean. The attention to detail within the residences and throughout the enclave are fitting of the name Trump. Residences feature private elevator foyers, panoramic views of the ocean, intracoastal and city, enormous balconies, smooth and high ceilings of 10 feet, pre-wiring for phone and cable, floor to ceiling windows, imported Italian designed kitchens and baths with marble, and complete designer fixtures including Miele and SubZero. Compound amenities include 24 hour valet and concierge service, massive three story entrance and portico, covered and secure parking, designer fitness center, poolside bar and health spa, beachfront cabanas, club room, and heated pool and spa. Lastly, the towers sit on two and a half miles of deserted beach. This is a paradise for the elite.